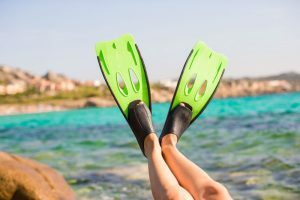 When performing water sports, it’s important to be kitted out in the right way so that you can fully enjoy your sport to the best of your ability. Having a good wetsuit top is important, as you will want something that not only keeps you warm and dry, but something that also looks nice at the same time. 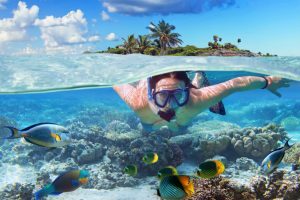 Wetsuit tops come in all shapes and sizes, colors and designs, and sometimes if you are a first time buyer it can be quite difficult knowing where to purchase one from, and which brand is best. The best thing to decide before purchasing is what sport you’re planning to carry out as some jackets may be better suited to specific sports than others. Luckily for you, we have found five different wetsuit tops from a few of the best known brands, for both men and women, so hopefully this will allow you to make the best purchase decision. In this article we take a look at a few benefits of Wetsuit tops and why they can be a good choice for you when out on the water, as well as five of the best wetsuit tops reviews that will hopefully give you some inspiration! 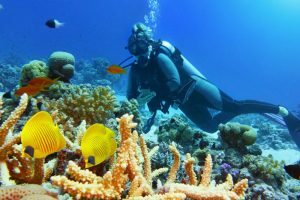 Wetsuit tops are often regarded by some as being less important, especially when in warmer waters where it may not be necessary to have a wetsuit top on. However, there are some benefits as to why people will wear them that you may not be aware of. 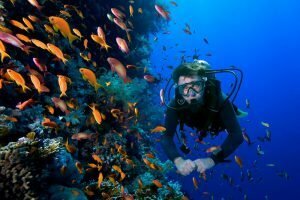 They increase your ability to swim – Wetsuit tops actually provide buoyancy. This can be especially handy when you feel less able to swim as they provide the wearer with an extra lift, making it easier to float if you feel you can’t swim as much and get into a panic. This is also good in the case of an emergency when, if something goes wrong, your chances of sinking are a lot lower when wearing a wetsuit top. By wearing the wetsuit top, it also increases how fast you swim than without. This is because the neoprene materials used are filled with small air bubbles and therefore allow the swimmer to use less energy and save some seconds when swimming by raising more of their body out of the water. 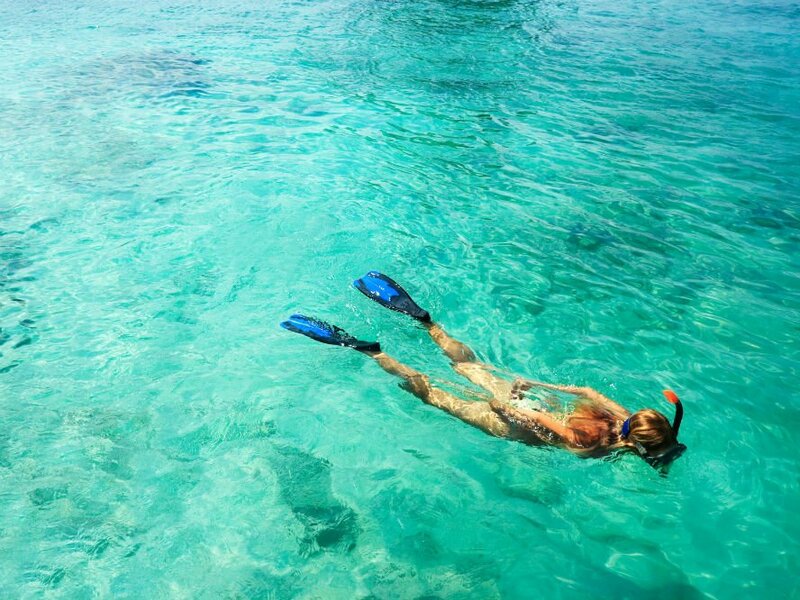 In fact, wearing a wetsuit can increase your swimming speed from 3 to 7%! They keep you warm – Of course one of the favored benefits of having a wetsuit top is for its heat insulation. In cold waters wetsuit tops can certainly help to keep you warm. 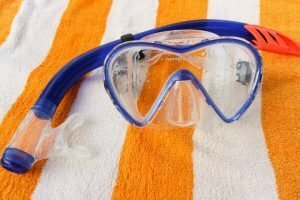 If you are sensitive to colder temperatures, then this is a great item to keep you feeling comfortable in the water. It also means you can enjoy your favorite sports no matter the time of year or how cold the water is. We have sourced five of the best wetsuit tops on the market, and will look at their key features, pros, and cons so that you can get a good idea of what’s best for you! 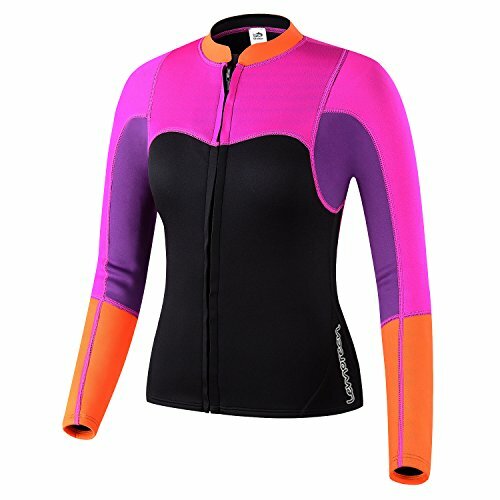 Lemorecm have the perfect wetsuit for women with their long-sleeved jacket. This is a great wetsuit jacket which can be used for diving, surfing, and a range of other water activities. We take a look at its key features below. Many customers have recommended to buy a size which is two times larger than you may think as it is made quite small. If you’re searching for a wetsuit that is weather friendly, then Lemorecn has created the perfect wetsuit jacket with you in mind. This wetsuit jacket features a comfortable and stylish design which will suit you in a range of different temperatures. Thanks to the stretchy 2mm neoprene material used in the making of this jacket, you can be guaranteed that it will keep you warm during the winter months. This means you can safely go out onto the water and enjoy your favorite sports no matter the temperature. Lemorecm have created a superb water resistant and UV protection jacket which is perfect for a range of different water sports. This jacket has been designed specifically for aqua aerobics and water fitness. 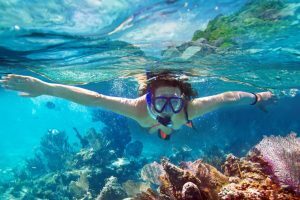 The best feature is that it provides protection against any sea lice, jellies, as well as other biological irritants which is definitely a plus! The wetsuit top by Goldfin is another jacket which is a great option if you are going out on the water, no matter what your preferred water sport is. This convenient jacket will keep you comfortable and warm with its stretchy neoprene design. We take a look at its special features in a little more detail below. A few customers complained that the neoprene material can have a strong smell at first and that the sizing is also a bit small. Goldfin are wetsuit design experts with over 10 years in the business. Therefore, you can be guaranteed a very good quality wetsuit when purchasing from them, and this product is no exception. The best thing about this wetsuit is its stretch design which means it can give you a bit of flexibility with the fit. It is also a very comfortable fit which is designed to keep you feeling confident on the water without any restrictions. The jacket is also extremely lightweight allowing you to perform your favorite water sport with ease. Goldfin are experts when it comes to wetsuits, and you can see this in the design of this jacket. It comes in two colors: pink with a blue section, or navy blue with a blue section. The vertical front zip allows for easy access and can be dressed up or down. Both the collar and wrist hems include adhesive material which sticks to skin in order to prevent any water getting in which is also helpful. The figure fitting wetsuit top by Eyce Dive & Sail is another great jacket for all your water sporting needs. This top is made from neoprene and is super stretchy – making it perfect for performing a range of different water sports. We take a look further below. This product is also running small in the size department, so customers are advised to order one or two sizes up. If you are looking for a wetsuit that is both waterproof and provides good heat insulation at the same time, then this wetsuit is a good product for you. Comfort is key when you are performing water sports such as kayaking, canoeing or paddle boarding, and you want to be able to wear something which does the trick. This Wetsuit is made with 3/2mm Neoprene which means it will fit your shape just nicely with room for flexibility. Investing in a jacket which will keep you warm is also important, and this one will do just that. Thanks to the excellent durability, you don’t need to worry about becoming cold when in the water which is something many people dislike about their water gear. Luckily, this one is made from quality materials, and will keep you nice and warm even in the colder winter months. The Eyce Dive & Sail women’s jacket comes in sizes ranging from S – 3XL meaning there is a jacket to suit everyone. It is recommended to order a size up from your normal one as these jackets are specifically designed to give a figure hugging fit to reduce the drag in water. When in the water, however, they will expand slightly as the water comes in contact with the material. The penultimate wetsuit top on our list is the men’s neoprene wetsuit jacket by Lemorecn. Much like the female version, this wetsuit top features a strong neoprene design which is perfect for all your water sport uses. Let’s take a look at its individual features below. Customers complained the sizing was off and that the quality was questionable. The men’s neoprene wetsuit top by Lemorecn is a great item to have if you love water sports and want to enjoy them in all seasons. This is a highly durable and strong wetsuit top which is guaranteed to last a long time. Lemorecn has created a strong wetsuit which is perfect for a number of different water sports including paddle boarding, kiteboarding, kayaking, canoeing, and especially diving. It features three layers of diving fabrics, composed of an outer nylon fabric, waterproof neoprene, and heatproof material which fits snug to the skin. The 3mm wetsuit top has been specially designed to keep you warm in colder temperatures and conditions. The neoprene is thick enough to keep warm, yet light enough for prolonged wear. It features a crewneck design which removes any irritation from seams and protects the neck from the zipper. 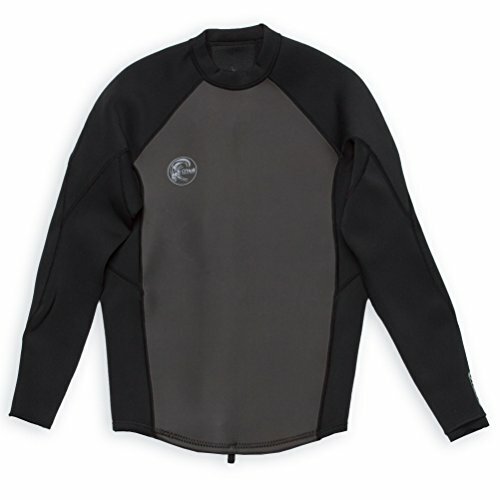 The final wetsuit top featuring on our list is the black zip jacket by O’Neill. Unlike the rest of the wetsuit tops mentioned on our list, this one is designed with spandex and features seamless paddle zones on each shoulder. We take a look at its key features a little more below. This jacket by O’Neill features a classic wetsuit design which is favored by many guys when it comes to water sports. At the same time, this jacket features a durable Neoprene composition which makes it extremely durable. Thanks to the smooth skin rubberized panels on the chest and back of the wetsuit, this protects the wearer from harsh winds and strong currents. It can also be useful in colder conditions as it is made with a strong Nylon material which keeps the wearer nice and warm. The 2/1mm Neoprene material is a very strong one indeed, and is bound to make this wetsuit top last a good amount of time. The smooth flatlock seams at the shoulders make it easy to get on and off. The material is also figure hugging, which will make it fit to your exact shape with ease. Wetsuit tops are clearly a crucial item to have if you want to improve not only your comfort, but also your safety when performing water sports out on the water. 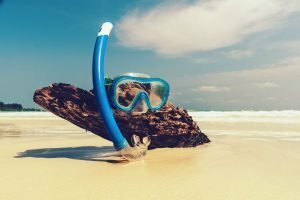 When shopping for a wetsuit top you may have certain criteria in mind, for example a budget, sports goal or any other factor that you want to make sure to include. We highly recommend all 5 wetsuit tops on our list and if you are looking for good quality, you will definitely find it with one of these jackets. If you are shopping on a budget however, then you are likely interested in buying a wetsuit top which isn’t going to break the bank. 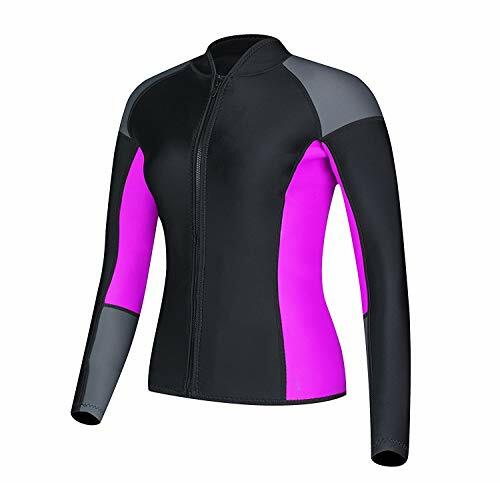 Therefore, beginning with the Women’s wetsuit tops, to help you out, we believe the best suited top for you would be the Goldfin Neoprene Wetsuit top as this one is pretty inexpensive in comparison to the other designs. 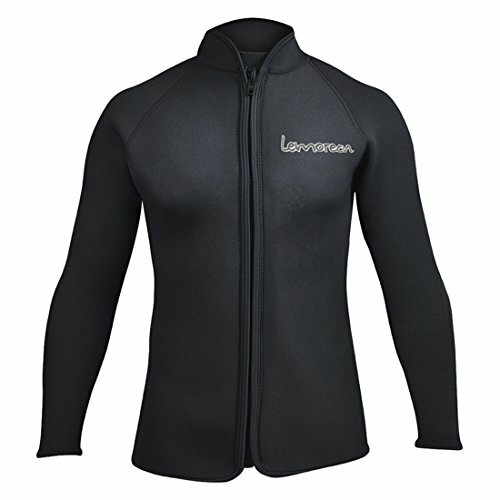 For Men on the other hand, the most suited jacket would be the Men’s wetsuit top by Lemorecn. This is also the cheapest option out of the options, and still one which is high quality. We hope this list has given you some inspiration for your next wetsuit top, and hopefully you will be feeling great on the water soon!